The Jerusalem Light Rail (in Hebrew: "Harakevet hakalla") is still quite new in town: although construction works began in 2002, it was completed only by 2010 and began to be actually in use in August 2011. The construction process was lengthy and very painful for all Jerusalemites concerned: more than one shopkeeper had to file bankruptcy in central western Jerusalem as access to the shops was as good as barred due to the endless construction site. Then came the archaeological findings in course of the digging - a very typical "plague" of Jerusalem: indeed, all building owners in this historical city know only too well that digging under one's one floor may have dire consequences: you incur the risk of ending up with a whole team of archaeologists from the Israeli Antiquity Authorities digging for several months on your own backyard and at your expenses ... and on the other end, if the authorities find out that you made archaeological findings without reporting them, you may be sued and heavily fined. Once the archaeological diggings were sorted out and done with, a new controversy raised around the Jerusalem Chords Bridge by the Spanish architect Santiago Calatrava: the idea and initiative came from then Jerusalem mayor Ehud Olmert, who wished to leave a grandiose signature on the city's landscape. The bridge stands as monumental and audaciously elegant construction taken out of a futuristic designers catalog, placed in a dull and somewhat sterile setting. The bridge was ready by 2008 and stood empty and desolate for 3 years. The costs: almost twice its original estimation - and Jerusalem city is one of the poorer municipalities in the country. New issues rose: the external pedestrian path was designed with a transparent glass bottom - little did the designer know about one of the most eminent citizens of that area of Jerusalem: it was absolutely unthinkable for them to have women walk on a glass bottom - as they were convinced that this would deprave the young men in the Orthodox society! So the municipality had to seek a compromise solution and eventually permission was granted to cover the glass bottom to make sure that no one would be able to see anything from underneath. Another issue was a highly political one: a legal insurrection began in 2007 against three French firms that took part in the construction, claiming the whole project to be racist and to make illegal use of "occupied territory". In March 2013, a French court ruled out all the claims. Today the Jerusalem Light Train is perhaps the first and utmost tool of genuine social integration. The way it works is very simple: Its path goes from East to West (South West-North East). Everybody can use it - provided he or she has a valid ticket (not such an obvious thing in Jerusalem, one of the poorest municipalities in the country). It has stops at a distance of 1-2 km each. From the Damascus Gate stop further north, its path corresponds to the "Partition Line" drawn by Israel and Jordan in 1949 as part of the armistice agreement. It now creates a physical link between very different neighborhoods - either Jewish or Arab. Its most important cultural asset is perhaps the message coming out of the speakers - in 3 languages: in Hebrew, in English and in Arabic. At each time, it gently reminds people not to forget anything in the train and announces the name of the station - an absolutely new urban phenomenon. For the first time in decades, one can see standing or sitting next to each other: Muslim, Jewish Orthodox or secular Israeli mothers with their children, talking in Hebrew, Arabic, Yiddish, French or English, next to Israeli soldiers, Jewish Yeshiva students next to Palestinian laborers, all mixed with tourists and visitors - all polite and even helping each other. Living next to each other is not only possible, it actually is happening right now, no matter how many open and unresolved issues remain to be tackled. I recently happened to overhear a conversation while travelling by train from central Haifa - in the north of Israel - to Herzliya, which is located in the central area of Israel, about 15 km north to Tel Aviv. A woman sitting in front of me had a conversation with a relative or friend of hers, obviously a woman too. The conversation was held in local Arabic. My knowledge of Arabic was not enough to understand every bit of that casual conversation, but enough though to notice several interesting characteristics - with the schooled ear of a linguist. The woman in the train was around 35-40 years old, she was wearing a western style dress, like an average Israeli woman at the end of a day's work - she seemed to work as a school teacher - a bit tired, making several phone calls one after the other, to take advantage of the available time while travelling in the train - typical of many Israelis. What caught my attention was the fact that, while talking in Arabic, the woman used various Hebrew terms, such as "Bituach Leumi" (national social care), "tachanat rakevet" (train station), "kupat cholim" (health care), all perfectly inserted into the flow of her speech. Obviously her partner did not seem to find this odd, rather this seemed the normal thing to do and probably the other woman would do the same. They didn't seem to notice even. This reminded me of other conversations in Arabic I had overheard over the years in Israel, such as two waitors in a hotel in Israel, two young men from the same "village", who would use Hebrew terms for objects such as the table cloth ("mapa") - which then seemed so odd to me (I had been living in Israel only 2 or 3 years then) that I interfered in their conversation and asked them about this - they laughed sheepeshly and said "We don't even notice that, it's a habit, we use the Hebrew terms for things at work". The woman in the train had to stop the flow of her conversation after she had mentioned that she just had to switch trains at the Binyamina train station: obviously her partner had never heard about this city in Israel. For a Hebrew speaking Israeli, this would seem rather odd - almost like an American citizen asking "What is New York? Where is it?". 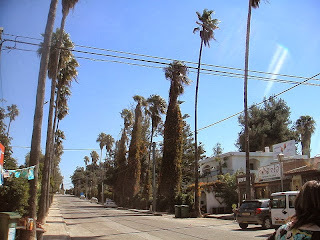 Binyamina is a Jewish town in Israel, which was founded in 1922 by Jewish settlers. By 1947 it had a population of 2000, in 2009, it had a population of 6000. 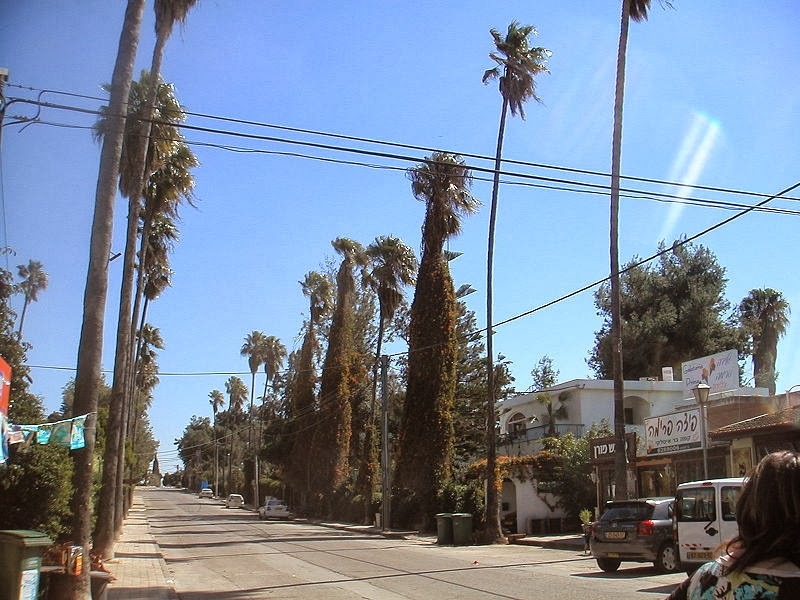 Among Jewish Israelis, Binyamina was the hometown of famous songwriter Ehud Manor, who mentioned this town in numerous songs, where is appears to have been heaven on earth. It now has several famous wineries and is one of the major highplaces of wine tourism in the country. I was surprised to realize that there was an Israeli Arab woman out there who seemingly had never heard before of the town of Binyamina. The woman in the train had to repeat the name at least 3 times and made at least 2 attempts to explain its geographical location: obviously the other woman was unable to even grasp that name or to imagine its location: it was a black hole in her mind, it did not exist. This brought me to the thought about myself, that even after more than 30 years in this country, there are numerous Arab villages that I don't know anything about - and even if I do, they are not part of my world. I feel like a perfect stranger there - so I actually could understand now that woman's reaction. Among all the events of the year 2010 in Israel, the forest fire on the Carmel Mountains at the beginning of December was one of the most striking events, because it displayed the country in an unusual position on the international scene: helplessness. What had started as a small fire in a pine forest on the Carmel Mountains had quickly turned into a raging and huge forest fire which soon was out of control. it cost the lives of 22 prison guards and one chief police officer, and destroyed the homes of 77 families. The Prime Minister was forced to call for help from neighboring countries; Greece, Cyprus and Turkey sent fire fighting airplanes, even the US sent a super sized fire fighting plane, and the Palestinian Authorities immediately sent their firemen to Haifa to back up their Israeli colleagues - a highly unusual opportunity to see who was ready to help. A relative of mine in Europe asked me: "How is this possible? How can such a sophisticated country, spearhead of modern technology, be so unprepared and so ill equipped to deal with a simple forest fire? That's odd; I find that difficult to understand." For the last few weeks I attend a series of lectures about Hebrew language intended for text editors. For a rather modest participation fee we are allowed to enter the holy temple of Hebrew language, whose priests and priestesses introduce us into its very secrets. The Academy of Hebrew Language (Hebrew Academy) resides on the university campus of Givat-Ram in Jerusalem - the campus which was built after 1967. The building was built in an architectural style typical of that time, with a flat roof; it stands on a hill, surrounded by a grove of tall maritime pines. Several years ago, a friend of mine invited me one day to come with her and attend an evening class at a Jewish Studies center in Tel-Aviv about Jewish traditional songs. At first this didn't sound especially attractive to me, I even suspected it to be terribly dull and boring. Then she told me that this wasn't one of those workshops where religious people lure non-religious people into making a "khazara be-tshuva", a "return to faith". Quite on the contrary, this workshop had been kicked off by a student from Jerusalem: as a student in musicology, he had chosen to study the various traditions of Jewish "Piyyut" - liturgical songs - among the various and numerous Jewish communities; while doing so, he came to realize that while Piyyut is indeed a very complex music, fully mastered by only relatively few people - all religious people going to temple - and that this tradition was in danger to fade away and disappear. During his field research, he had had this idea that Piyyut has an enchanting power of its own, even for those who are not religious. Everybody has heard about last week's events, that is, one of its various versions. Obviously, seen from Israel, the situation is a totally different one than seen from the outside, even though it is quite obvious even from inside Israel that there are very different and diverging points of view. I have just returned from a five-days visit in Brussels at my father's. Since my family is scattered over several countries in central Europe, we usually gather at one particular point, to save time; it so happened that I hadn't been in Brussels (Bruxelles, in French and in "Wallon", the Belgian French dialect) in almost 10 years. I found the city very much changed; i remembered from my last visit that the center of the city was filled with quite annoying construction sites. now the city has been revamped and looks like a modern metropolis, with a character of its own. My father has been living for the last ten years in the rather central neighborhood of Ixelles (http://en.wikipedia.org/wiki/Ixelles), which has a very mixed population of rather low income citizens and immigrants, as well as wealthy bourgeois living in splendid 19th century villas and majestic neoclassical pavilions - no need to mention that Israel has none of these, certainly not in Tel Aviv - although Tel Aviv has beautiful houses and residential areas of its own. On the last day of my visit, after the big family gathering had come to its end, we had a small and quiet walk through the streets of Ixelles and walked into the "parc de l'abbaye de la Cambre", along some of the numerous Ixelles ponds (in French: "les étangs d'Ixelles": see Abbey of La Cambre). Why should one bother to write about ordinary life? I believe that looking at everyday life will teach you things you will never find out about by watching TV news or reading articles. These notes are mere observations and they reflect my very personal point of view. May you enjoy reading them, wherever you are in the world and in the path of life! Subscribe To "Life in Israel"